A passion for both stories in all their different forms and doodling around on a 20-year old keyboard in the attic of his parents’ place brought the then 13-year old Tom to the conclusion that composing music for films was the thing that had to be pursued. During his teens, this was met by making short films with friends, just so he could write the music for them, and by making a 10-year plan to achieve this goal. This plan got a small bump when he was advised to study classical music composition first, and then specialize in film music. This advice turned out to be nothing of a bump in the end. In his time at the bachelor classical composition at the Conservatory of Amsterdam, Tom has learned to compose, orchestrate and to have a clear vision behind every note you write. This led to pieces and performances for symphony orchestra, wind band and ensembles of all kinds and sizes. His pieces were performed in the Concertgebouw Amsterdam, Muziekgebouw aan ’t IJ, Felix Meritis, Carrè theatre and many other venues in the Netherlands and abroad. Next to his original works for live performance, Tom has worked on several arrangements and has been developing his skills in virtual orchestration using software and samplers throughout his bachelor. In 2016, Tom started the Master ‘Composing for Film’, where he continued his 10-year plan and arrived at the place where his passion started and never left. The master has given him the opportunity to work in a collaboration with students of the Netherlands Film Academy on a variety of films of different styles, where each film requires a different approach and a different sound palette; a challenge Tom is happy to take. 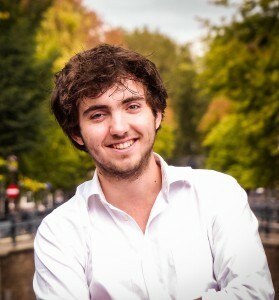 In June 2018, he’ll graduate with the films zelf, The Library of Things, Swimming to the Moon and Bladgoud and a thesis on hyperorchestration as a creative tool in film music. The Library of Things gave Tom the opportunity to write the music for a 55-piece orchestra, which was recorded for the film in Skopje, Macedonia.